Kathryn Hartnett is a local singer and will be the first entertainer to provide Music under the Trees at the Wingello Village Store. On Saturday, 10 December from 1:00 to 4:00pm, while Kathryn gives us all a fine rendition of her singing talents, Pizza will be available as well as our normal great food and drinks, all in the shade of the beautiful trees in the Wingello Store back yard. This has been fully renovated and landscaped by Don Turner (Earthworks) and Warwick Spackman (landscaping), next to the fully renovated shed by Daniel Hill (Carpentry). These are all local tradesmen who provided great quality work. Thieves about, Wingello watch out! A few weeks ago, a chair was used to smash one of the rear windows at the shop. The thief only succeeded in breaking the window, cutting himself and leaving blood in several places. The same thieves attempted to break into Tallong the night before. The following week the crooks actually broke into Tallong, smashing the window, knocking over the grocery shelves and discovered the till was empty at night time. So no actual theft just stupid damage. Other vandalism and petty thefts have happened, most likely from the same culprits. Perhaps they don’t realise that their fingerprints and DNA evidence are on record and when they are caught in future all of these escapades will come back to haunt them. The school has also been broken into twice causing much damage and minor thefts. If you see someone who has cuts to his hands or arm, ask him where he got them. We want our village to be a safe place to live. It is thought the crooks are from somewhere between Wingello and Marulan. Some of you know who is doing these thefts. Don’t let them get away with it. This is from only a few people. A very small group that aren’t very bright. A vigilant Wingello will uncover the culprits. 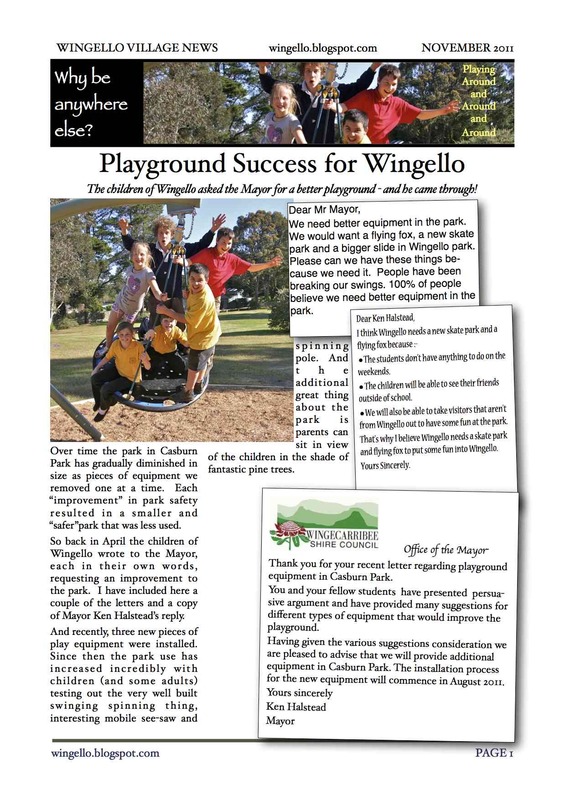 The children of Wingello asked the Mayor for a better playground - and he came through! Over time the park in Casburn Park has gradually diminished in size as pieces of equipment we removed one at a time. Each “improvement” in park safety resulted in a smaller and “safer”park that was less used. So back in April the children of Wingello wrote to the Mayor, each in their own words, requesting an improvement to the park. I have included here a couple of the letters and a copy of Mayor Ken Halstead’s reply. And recently, three new pieces of play equipment were installed. Since then the park use has increased incredibly with children (and some adults) testing out the very well built swinging spinning thing, interesting mobile see-saw and spinning pole. And the additional great thing about the park is parents can sit in view of the children in the shade of fantastic pine trees. Dear Mr Mayor,We need better equipment in the park. We would want a flying fox, a new skate park and a bigger slide in Wingello park. Please can we have these things because we need it. People have been breaking our swings. 100% of people believe we need better equipment in the park. The students don’t have anything to do on the weekends. The children will be able to see their friends outside of school. We will also be able to take visitors that aren’t from Wingello out to have some fun at the park. That’s why I believe Wingello needs a skate park and flying fox to put some fun into Wingello.Yours Sincerely. 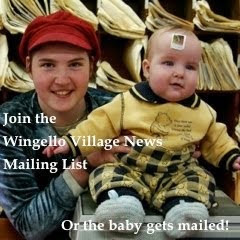 Wingello Village News for November 2011 is out. Wingello is a great place to live. Are you ready for this fire season. Bush fires are a natural part of the Australian environment and occur regularly, but many people fail to prepare for them. When threatened by bush fires, people will often leave it too late to make critical decisions and often have few safe options left. So begins the excellent Rural Fire Service’s Bush Fire Survival Plan booklet. You may recognise some local personalities in the above photo which forms part of the booklet. On Saturday, 24 September the local fire brigade had an Open Day followed by a very important Community Awareness Meeting. This was a combined meeting for Bundanoon, Penrose and Wingello but there was a very poor showing. When there is a sniff of smoke in the air, everyone becomes very concerned. This is often too late. Wingello is a beautiful little village, surrounded by forest. While the forest is a great part of the area’s beauty, it is also the source of our real bushfire risk. As a resident you need to know how to prepare your home to reduce fire and ember risk, to prepare yourselves and have an evacuation plan in place, understand the fire danger ratings and what to do if a fire is threatening. The Wingello Fire Captain is a very effective speaker, helping us to understand the dangers that bushfires pose. 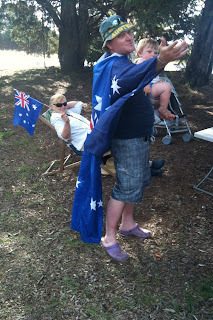 The lessons of the recent Victorian bushfire disaster were certainly made relevant to us all. 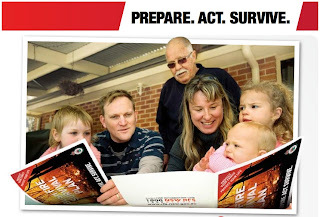 It is critical that all families and residents have a current Bush Fire Survival Plan. These are available from the Wingello Shop or Fire Station. The brigade is currently sending out a survey form and hope that everybody will complete and return it to the Wingello Shop addressed to the Wingello Fire Brigade. This survey will assist our fire brigade in defending your property in case of a fire. Shortly the brigade will be visiting properties to help and advise on preparing yourself and property in the event of a bush fire. A justifiably proud Simon next to his new dry stone wall. A well built stone wall lasts for generations and is a very beautiful addition to any property. One of the Wingello residents had a Stonewall building workshop and it went very well. Lots of participants had a fulfilling time learning how to build a dry stone wall from what would normally be considered very poor stones. The result is something all concerned would be proud to have contributed to. You may have noticed all the work being done at the front of the Fire Brigade. The David Quinlivan Memorial Garden has been re-established and is looking very good. During the bush fires in the Wingello State Forest in January 1998 a Wingello tanker was seriously overrun by fire. This resulted in the tragic loss of the brigade's Senior Deputy Captain, David Quinlivan. The remaining seven crew members who escaped the tanker sustained serious burns and injuries. On Saturday 8th October the rededication of the David Quinlivan Memorial Garden was carried out by the NSW Rural Fire Service Commissioner Shane Fitzsimmons. David’s parents had flown up from Victoria to attend and assisted the Commissioner in the unveiling of the plaque. Thank you to all local residents who attended on the day. How does the mail work in Wingello? Wingello is a fully featured Licensed Post Office. We are not large enough to have Australia Post Electronic Services - we are one of over 300 manual Post Offices around the country. Mail arrives Monday to Friday between 7:30am and 8:15am. The letters are then sorted into each resident’s mail folder or PO Box, then parcels are recorded and a red card placed in the appropriate folder or PO Box. As you know, Wingello is tricky for addresses. Some streets have alternate names, numbers may be duplicated and some have almost random lot numbers or house names. We have no choice but to go by names which we match to addresses where we can. To assist in this matching process we maintain a database of names and addresses which has helped us in delivery. If you are new to the area, let us know who you are. If we can’t find a match on the name, mail will be Returned to Sender after 2 weeks. If you complete a Bill Pay by 3:00pm, it will be included in our reports which are included in the daily mail. This is sent to the processing area in Melbourne where the details are recorded and the billers are notified. Although this may take 2 to 3 days between payment time and notification, the official Wingello Post Office stamp serves as proof of payment. We also take phone calls from billers if they require confirmation sooner. 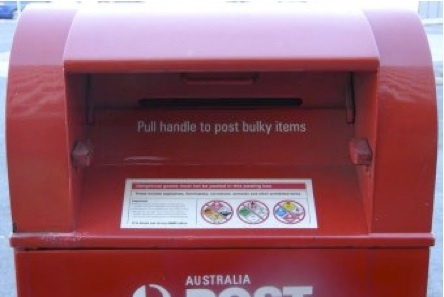 At 3:45pm the mail is picked up and taken to the Bowral processing centre. From here it is sent all over Australia and Internationally. Sometimes mail is delayed. But as you can see by our timing above, it is caught up in the system outside of Wingello. We do not hold onto mail. 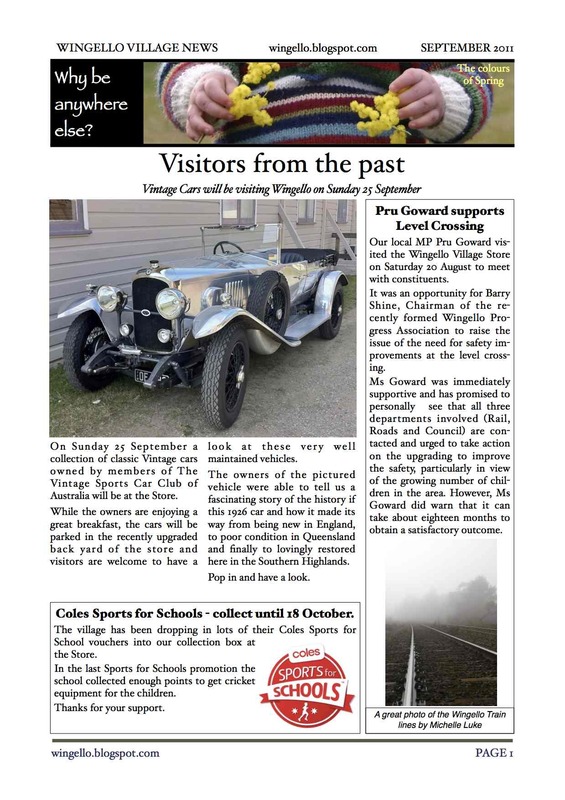 Wingello Village News for October 2011 is out. 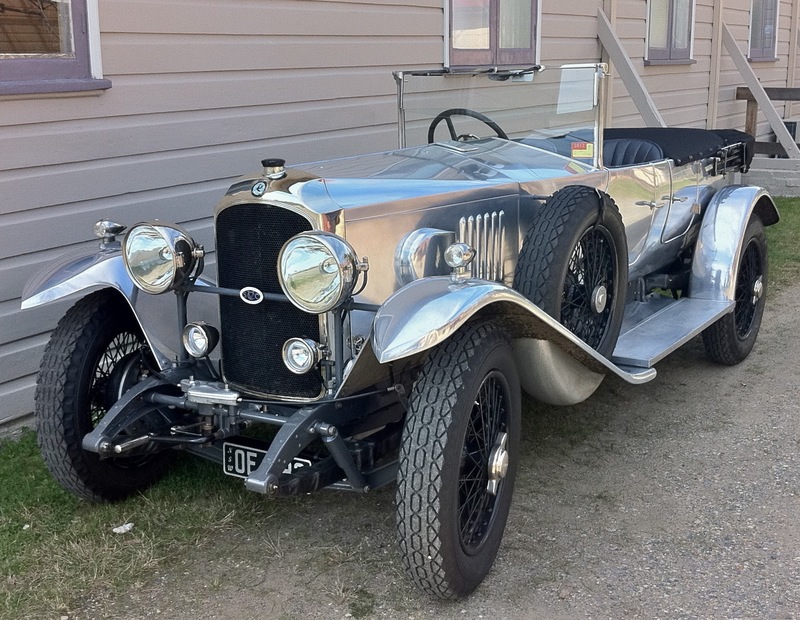 On Sunday 25 September a collection of classic Vintage cars owned by members of The Vintage Sports Car Club of Australia will be at the Store. While the owners are enjoying a great breakfast, the cars will be parked in the recently upgraded back yard of the store and visitors are welcome to have a look at these very well maintained vehicles. The owners of the pictured vehicle were able to tell us a fascinating story of the history if this 1926 car and how it made its way from being new in England, to poor condition in Queensland and finally to lovingly restored here in the Southern Highlands. Our local MP Pru Goward visited the Wingello Village Store on Saturday 20 August to meet with constituents. It was an opportunity for Barry Shine, Chairman of the recently formed Wingello Progress Association to raise the issue of the need for safety improvements at the level crossing. Ms Goward was immediately supportive and has promised to personally see that all three departments involved (Rail, Roads and Council) are contacted and urged to take action on the upgrading to improve the safety, particularly in view of the growing number of children in the area. However, Ms Goward did warn that it can take about eighteen months to obtain a satisfactory outcome. Tess and Lucy trying to hide during the clean up day. As you may have seen, new radio mast and antennas have been erected and are ready to be put into service. These will improve the reception of the brigade’s communications systems to and from the fire control center and also the mobile and portable radios that are used in every vehicle and in the field. Many thanks to Simon Dickson for helping us with the erection of the mast and also some additional excavation. A clean up day was held at the Station recently and the station truck and work bays are looking good thanks to the guys and girls that helped with all the work. Also thanks to Paul Spackman who has been doing some plumbing for us for our new wash down bay for the CABA crew. 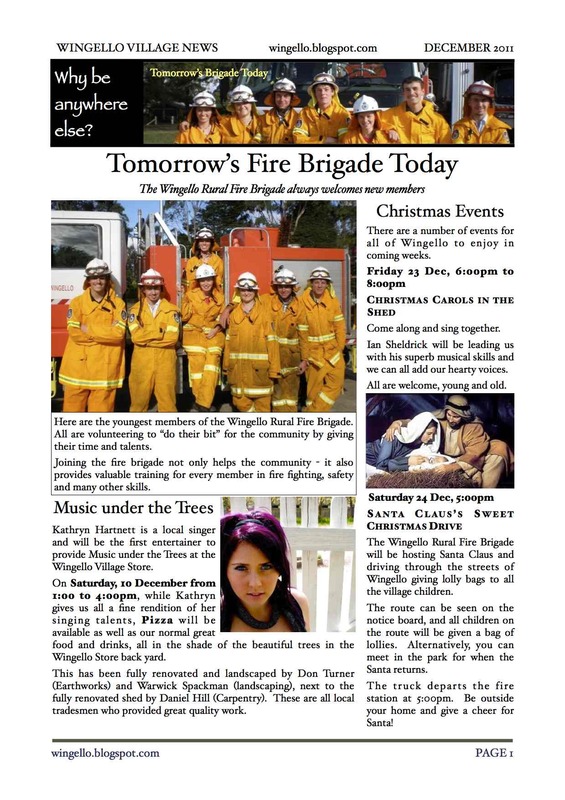 The Wingello Rural Fire Brigade is having an Open Day at the fire station on the 24th September. Visit your station and see the work the volunteers have been doing and meet up with your local volunteer men and woman Firies . There will even be plenty of goodies for the little ones. 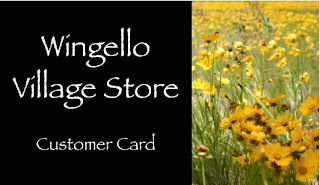 Wingello Village News for September 2011 is out. Vejjasala or Place of Healing is a new project of the Association of Engaged Buddhists which is to be opened officially on Sunday 11th of September 2011. All are warmly welcome and invited to attend. Vejjasala, which is located on a beautiful property at 219 Forest Road Wingello is a special small scale retreat centre dedicated to helping people when they face serious illness, grief and loss in their lives. The centre is made available to anyone (not just Buddhists) who finds themselves dealing with serious illness. The centre is run and staffed by volunteers under the guidance of our resident teacher Bhante Tejadhammo. Bhante is an Australian born monk who has been involved in this work for more than 20 years. Bhante’s own ancestors were pioneers in the area of Paddy’s River, Bundanoon and Sutton Forest, having arrived from Ireland in 1851. Many of them are buried in the small cemetery at St. Patrick’s Catholic Church at Sutton Forest built around 1880. Chanting followed by short meditation. 11:00 am Offering of Dana to Sangha members (monks and nuns) & shared lunch for the community and all welcome guests & visitors. Time for people to just enjoy being here! Our Christmas in July Community Dinner was very successful. 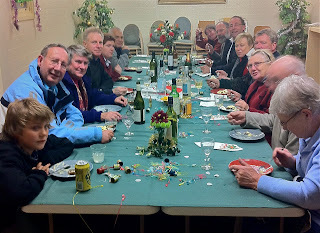 We had glazed ham and turkey with Christmas puddings as well as enjoyable company making for a great night. For the next community dinner we will be celebrating “Spring Carnival” on Friday 23 September. Dress up, enjoy a great meal and fun company and even BYO. 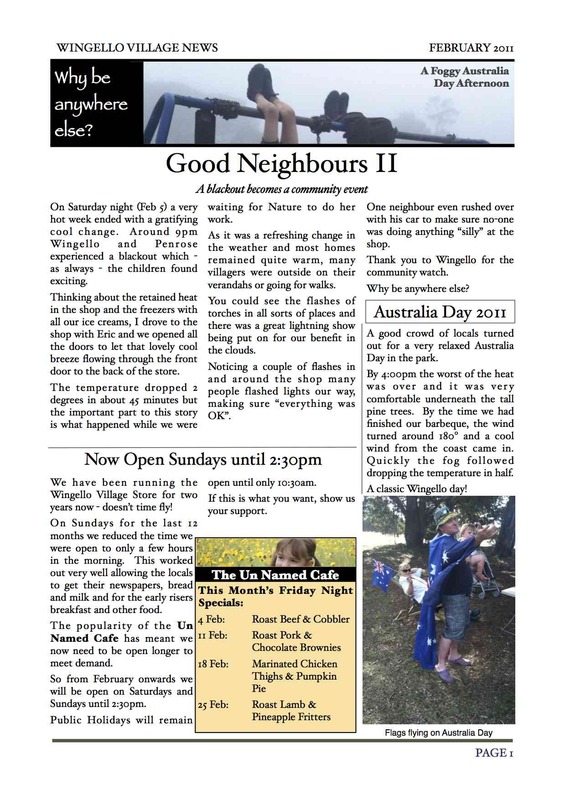 Wingello Village News for August 2011 is out. blocked all through traffic between Wingello and Penrose. On Tuesday at around 1:00pm a tree along the road between Penrose and Wingello (just South of the Railway Overpass) fell down in the high winds. Unfortunately it fell straight across the road and onto the power lines, snapping the lines and bringing down about 500 metres of lines. Luckily the old power poles had been recently replaced with new poles which remained in place. So began the 28 hour blackout for central Wingello with some outer areas out of power for much longer. When we get a blackout you need to consider a number of problems. 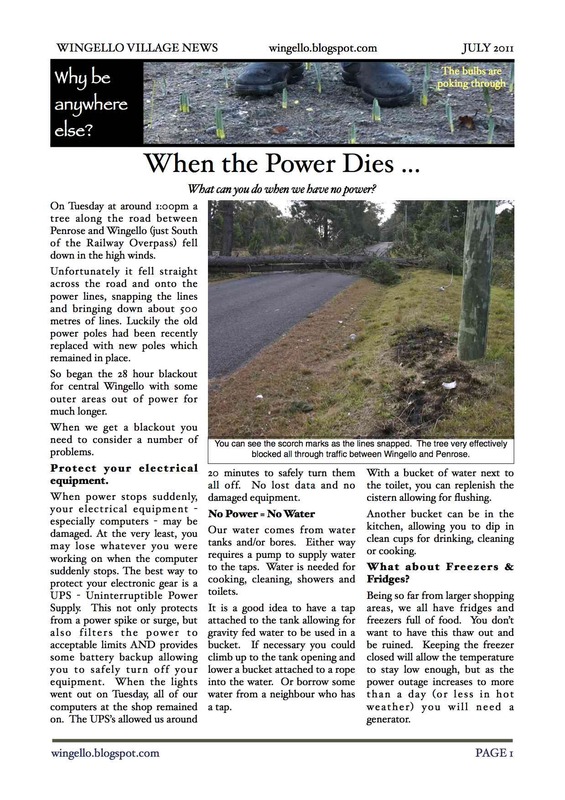 When power stops suddenly, your electrical equipment - especially computers - may be damaged. At the very least, you may lose whatever you were working on when the computer suddenly stops. The best way to protect your electronic gear is a UPS - Uninterruptible Power Supply. This not only protects from a power spike or surge, but also filters the power to acceptable limits AND provides some battery backup allowing you to safely turn off your equipment. When the lights went out on Tuesday, all of our computers at the shop remained on. The UPS’s allowed us around 20 minutes to safely turn them all off. No lost data and no damaged equipment. Our water comes from water tanks and/or bores. Either way requires a pump to supply water to the taps. Water is needed for cooking, cleaning, showers and toilets. It is a good idea to have a tap attached to the tank allowing for gravity fed water to be used in a bucket. If necessary you could climb up to the tank opening and lower a bucket attached to a rope into the water. Or borrow some water from a neighbour who has a tap. With a bucket of water next to the toilet, you can replenish the cistern allowing for flushing. Another bucket can be in the kitchen, allowing you to dip in clean cups for drinking, cleaning or cooking. that took flight during the winds. What about Freezers & Fridges? Being so far from larger shopping areas, we all have fridges and freezers full of food. You don’t want to have this thaw out and be ruined. Keeping the freezer closed will allow the temperature to stay low enough, but as the power outage increases to more than a day (or less in hot weather) you will need a generator. Check out the power requirements for your main power needs and match this to the generator capacity. As Generators run using Petrol, you will also need a suitable container to store enough fuel to keep the generator going. And don’t forget extension leads to bring the power from the generator to the equipment. Lighting can be achieved by candles or battery powered lights. Where are yours? If the blackout occurs at night it is hard to find the lights if you can’t see. You can even use your mobile phone to provide emergency lighting. If you have all electric heating and cooking, do you have a little gas stove? There is always the barbeque too. One pot meals are pretty easy on the gas cooktop. Typically the phone-lines still work during a blackout. But hands free handsets won’t work as the base station requires power. Do you have a non powered handset to plug in when the power dies? The Wingello Village Store has gas cooking and generator power to keep our refrigeration and basic lights working. If you want someone else to cook, you can always go to the shop until 6pm Monday to Thursday, 9pm on Fridays or 2:30pm on weekends. Our fire was providing much loved warmth on Tuesday and Wednesday when many of the locals popped over to see what was happening and enjoying some local company. 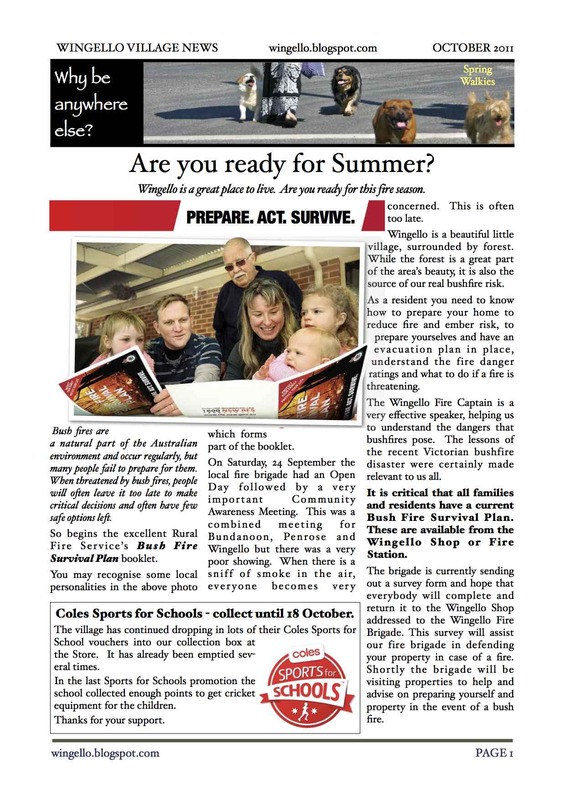 Wingello Village News for July 2011 is out. to reflect the end of the war in 1918. In 1917, members of the Mechanics Institute built the hall and gave it to the community. Since that time it was managed by local residents and it was the home to many dances, meetings and other events for the community. One matter affecting the running of the hall was community interest. Over the years the hall almost fell into disrepair and the management committees were restarted almost from scratch numerous times. Luckily, each time some people were found willing to donate their time and effort and try to keep the hall available for community use. Funding for repairs and maintenance was always an issue. Funds were raised through various means to fix up one thing or another and pay for the necessary building and contents insurance. This kept going up, especially considering the hall is a wooden building built 80 years ago. Finally the effects of insurance and public liability claims began to take its toll. Members of the management committee discovered they would be personally liable if someone decided to sue them. 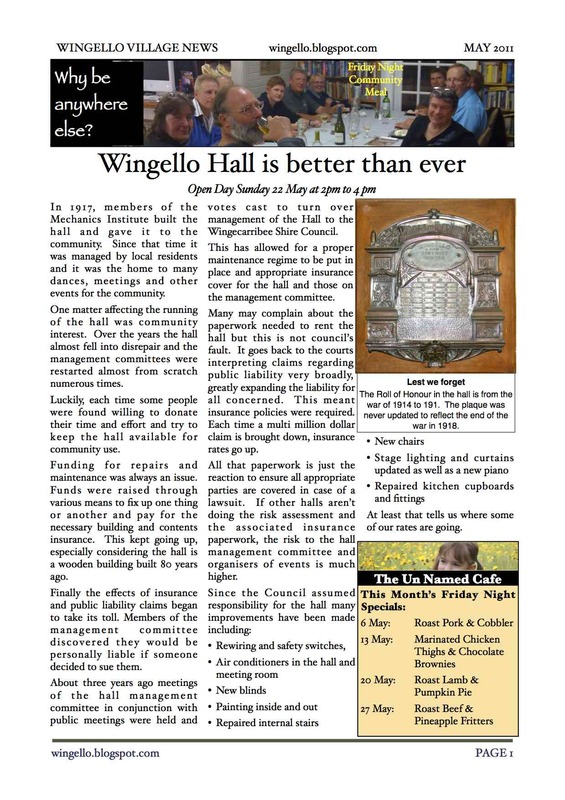 About three years ago meetings of the hall management committee in conjunction with public meetings were held and votes cast to turn over management of the Hall to the Wingecarribee Shire Council. This has allowed for a proper maintenance regime to be put in place and appropriate insurance cover for the hall and those on the management committee. Many may complain about the paperwork needed to rent the hall but this is not council’s fault. It goes back to the courts interpreting claims regarding public liability very broadly, greatly expanding the liability for all concerned. This meant insurance policies were required. Each time a multi million dollar claim is brought down, insurance rates go up. All that paperwork is just the reaction to ensure all appropriate parties are covered in case of a lawsuit. If other halls aren’t doing the risk assessment and the associated insurance paperwork, the risk to the hall management committee and organisers of events is much higher. At least that tells us where some of our rates are going. The Wingello Forest Ride is on again, this time hosting the South Coast Zone Championships. The ride will be run over the prettiest trails that Wingello State Forest can offer – through tall mature pine forests, natural bush and ferny gullies. The ride is undulating so horses need to be fit, but is great underfoot and has plenty of shade and water. They have a new ride base this year on private land adjacent to the forest. This is the third year the horse endurance event has been run in the Wingello State Forest and is gaining a reputation as an excellent event. Horses and riders from around the country are coming here to experience the Wingello we are lucky to live in. It was quite a chilly night on 29 April and The Wedding was being televised but that didn’t stop the inaugural Wingello Community Dinner. We decided to hold it inside the shop to gain the benefit of the cosy fire. All told it was a lovely evening. 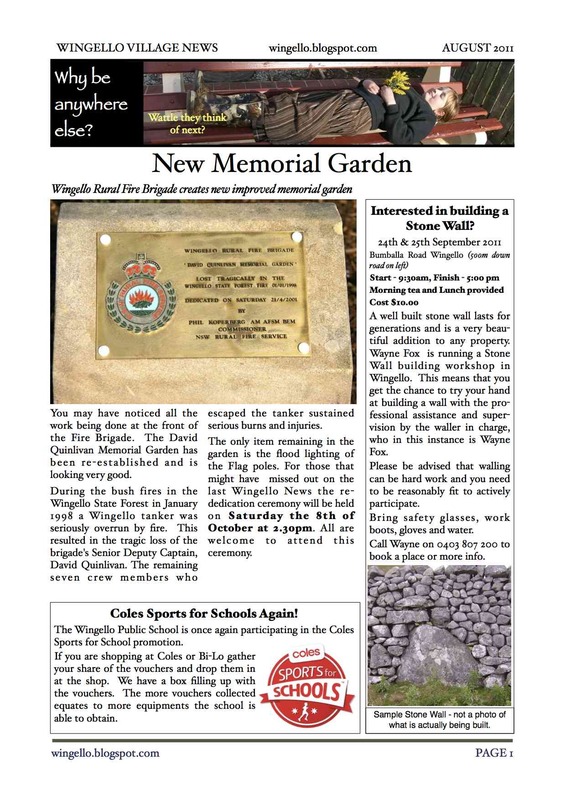 Wingello Village News for May 2011 is out. Now that we have completed the renovations to the Old Produce Shed, we are proud to host a regular Wingello Community Dinner. This idea arises from a customer’s suggestion. He was enjoying the ad hoc meeting of other locals and thought a dinner around one long table would be even better. Research with other villagers confirmed the desire for a communal dinner. Rather than have everyone sitting all around the store, we will be setting up a long table in the Old Produce Shed so we can all get to meet and chat with fellow villagers and guests. Bookings are essential so we can cater appropriately. A fixed price of $22.00 covers a fixed entree, main meal and dessert. BYO wine or beer. Soft drinks and Cafe drinks are all available at normal prices. The Friday night restaurant is going very well and we appreciate all your support. This year Easter is a bit longer thanks to the Anzac day public holiday. As in past years we will be closed on Good Friday. Easter Saturday will be normal Saturday hours of 8:00am to 2:30pm. Easter Sunday, Monday and Tuesday will be Public Holiday hours of 8:00am to 10:30am. For those remaining around the village this Easter, a nice breakfast or morning coffee would be a good lazy way to start the day, either enjoying the morning sun in Maple Lane, or the fireplace if it is a lot colder. 15 Minutes from Wingello is the Pauline Fathers Catholic Monastery. You may not realise that at a country spot on Hanging Rock Road is a monastery and Church that seats 800! The monastery started with a tin shed in 1984 and over the last 27 years has grown quite a lot. 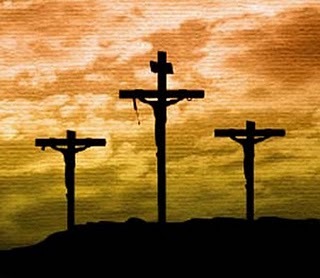 Every year on Good Friday they have a Passion Play, where a cast of actors play all the parts of the Passion of Jesus Christ - that is the history from when Jesus was hailed as a King on Palm Sunday through to his Crucifixion on Good Friday. It is a great experience and open to all. There will be over 1,000 people attending to watch and walk along as the play starts at the entrance and moves from scene to scene until it ends at the grotto. The play starts at 11:00am. You should plan to be there at about 10:30 to get a car park and be part of the experience. The Association of Engaged Buddhists is a group of lay Buddhist practitioners and resident ordained Monks and Nuns who are committed to putting the Dhamma into action within their own lives in order to be of benefit to all. Established in 1993, the Association runs regular evenings of meditation at Sangha Lodge in Lewisham, as well as retreats, workshops and courses in response to specific needs. The Association’s main aim is to share in a non-sectarian way the many benefits of the Dhamma with the wider Australian community. The association has taken over the property at 219 Forest Road for use as a Retreat centre. Once they are up and running they will have an open day so that any interested locals can see what they are all about. This is Bhante, the Spiritual Director of the Association and senior resident monk. You will see him occasionally in the shop enjoying a coffee and a meal. Yummy. Served with Jam and Cream. Eric’s scones once more won first prize for Scones. Lana won first prize for her Muffins and biscuits. This is not surprising to all those who have enjoyed these delights at the shop, but it is good to have confirmation! The parking control people had their 4WD vehicles ready to pull vehicles through the exit (like they needed to for our Transit van). So whether an award was won or not, all that attended the Show were winners. 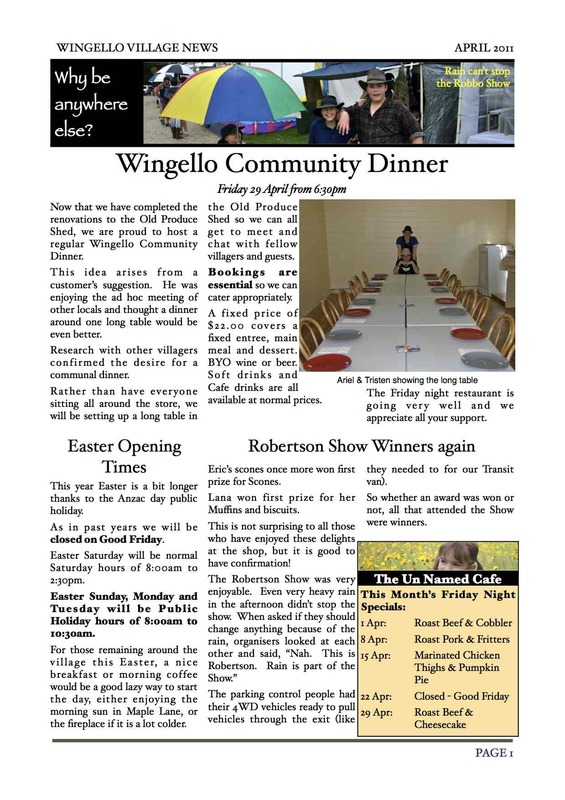 Wingello Village News for April 2011 is out. Just down Bumballa road is the Pinehaven Stud and Chestnut Farm. We are now in the Chestnut season which lasts from 25th March to 29th April each year. The farm grows a number of different Chestnut varieties including Morena, Prolofic, Special, Purton’s Pride and their very own King chestnut. The farm is so close to us and the public are encouraged to pop in and pick their own chestnuts. The farm has all the facilities required including toilets, barbeque and chestnut roasting too. On Sunday 27 March, the farm is hosting a Free Chestnut Roasting at the shop to let us experience the delights of roasted chestnuts. 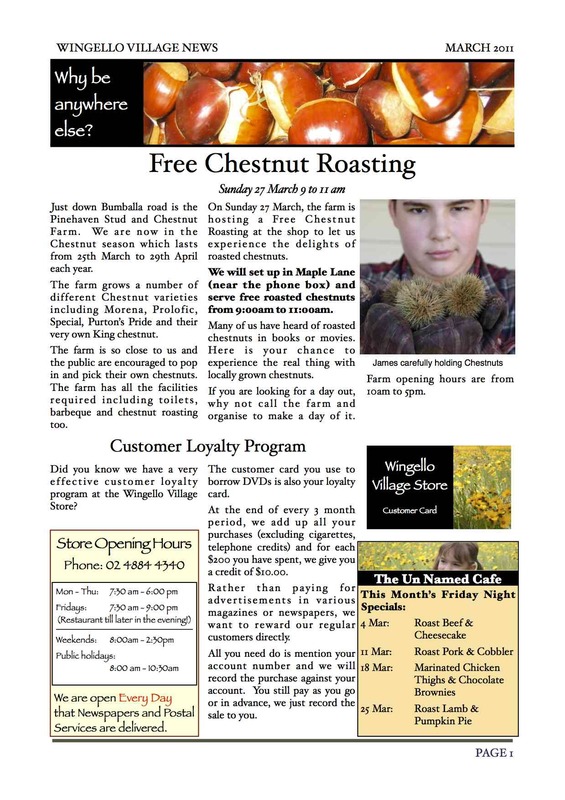 We will set up in Maple Lane (near the phone box) and serve free roasted chestnuts from 9:00am to 11:00am. Many of us have heard of roasted chestnuts in books or movies. Here is your chance to experience the real thing with locally grown chestnuts. If you are looking for a day out, why not call the farm and organise to make a day of it. Farm opening hours are from 10am to 5pm. Back in the Age of Sail, the time of Napoleon and Wellington, boys as young as 15 were Lieutenants in the army and navy. 15 was considered an age of responsibility and the young person was expected to contribute to their family and society around them. Even going back to the 1960s, young people were regularly employed in many businesses formally as apprentices or trainees, or informally as paperboys, lawn mowing, cleaning, etc. This utilisation of the talents of young people was a benefit to themselves, their families and society as a whole. That is why we like employing young people at the Wingello Village Store. Every young person employed takes part in our immersive training program, learning all the facets of our rather diverse little shop. Learning about the businesses of Retail, Cafe, Restaurant, Post Office and handling all the goods and services we provide gives a good start to any resume. If they work in a full time position, we then enrol them in an official traineeship which provides nationally recognised TAFE equivalent certification. They also are provided with formal food safety certifications through registered training organisations. The village also benefits from having young people working in the store. Often there is friction between generations and much of it is caused by the lack of contact the generations have in day to day settings. The opportunity for young people to interact with the village and for all villagers to meet young people in a helpful environment provides great benefits. A further benefit is the general youthful playfulness and joy of life. The store - and village - are happier places with young people having a somewhere to utilise their skills and share their lives in the midst of village life. There are few places where young people have the opportunity to be such an integral part of a small community. We are providing a structure whereby young people of the village can learn useful skills, get paid doing it and participate productively in village life. Being young, they will eventually move on to other employment and we envisage a steady flow of young people working in the store. The more the shop is patronised by local villagers the more we will employ locals. By shopping locally, the whole village benefits in many ways. 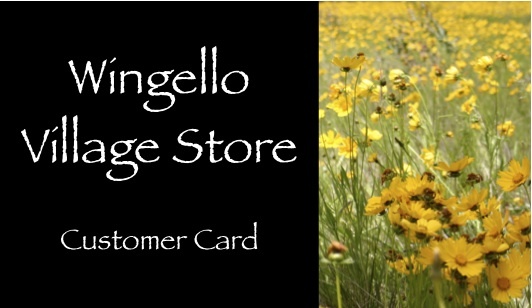 Did you know we have a very effective customer loyalty program at the Wingello Village Store? The customer card you use to borrow DVDs is also your loyalty card. At the end of every 3 month period, we add up all your purchases (excluding cigarettes, telephone credits) and for each $200 you have spent, we give you a credit of $10.00. Rather than paying for advertisements in various magazines or newspapers, we want to reward our regular customers directly. All you need do is mention your account number and we will record the purchase against your account. You still pay as you go or in advance, we just record the sale to you. 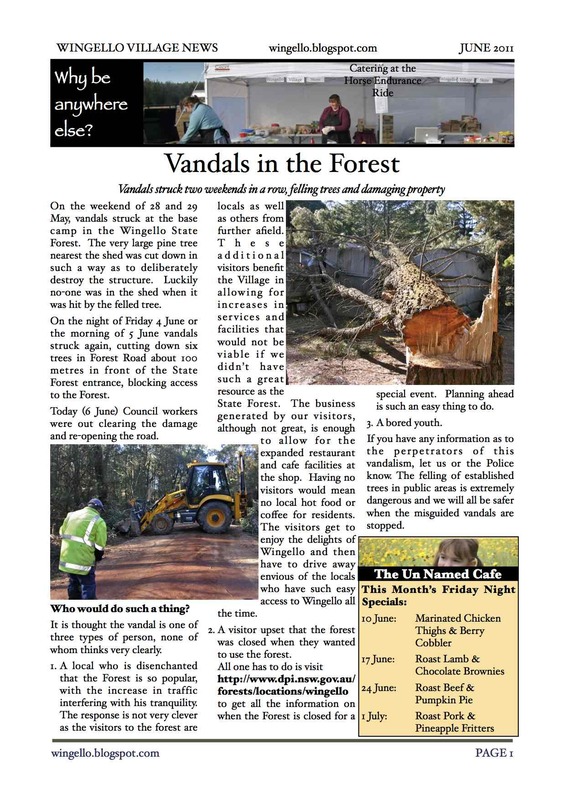 Wingello Village News for March 2011 is out. Hanging around on the swings as the fog rolls in. 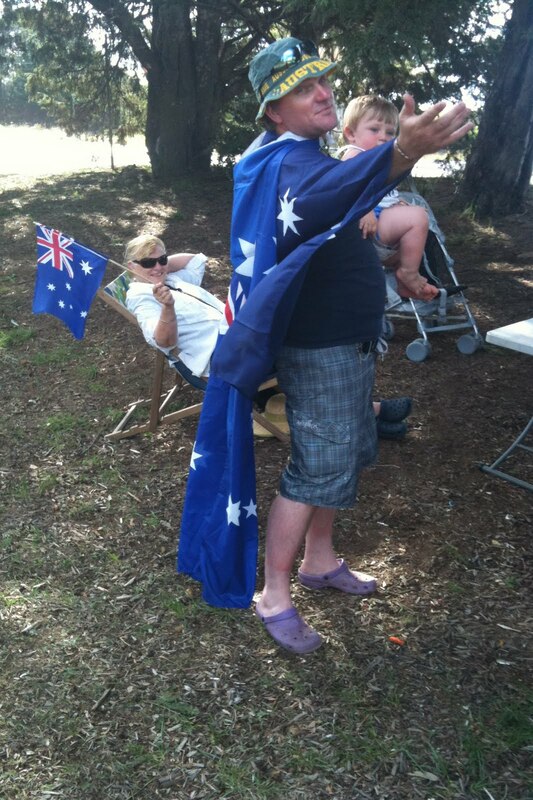 A good crowd of locals turned out for a very relaxed Australia Day in the park. By 4:00pm the worst of the heat was over and it was very comfortable underneath the tall pine trees. By the time we had finished our barbeque, the wind turned around 180º and a cool wind from the coast came in. Quickly the fog followed dropping the temperature in half. Small villages and towns are famous for the interest residents have in each other. This is often viewed as scary by those used to the anonymity of big city life. People who have grown up in a small village are used to knowing many or all of their fellow villagers. When they make a move to the larger city there is the culture shock of being surrounded by millions of people yet knowing hardly anyone on a more than cursory level. In Wingello we have a good blend whereby you can live your own lifestyle without interference from others yet neighbours are there if you need them. We had an example of this a few days ago. A house was vacant during the holidays with the owners away. The neighbour heard a CRACK and went to investigate. The power cable joining the house was sparking and shorting on a semi regular basis. The neighbour knew who was caring for the house while the owner was away and gave her a call. When she arrived he quickly rushed out and stopped her entering the property. She hadn’t noticed the power shorting and could well have been injured by the electrical fault. The first thing one must do in this case is dial 000 (Triple Zero). Don’t try calling Integral or the Fire Brigade directly. The emergency services will contact the appropriate authorities and the necessary response happens quickly. In this case the 000 Centre contacted the Wingello RFB whose members’ pagers went off. They responded quickly and assessing the situation contacted FCC (Fire Control Centre) in Mittagong who called Integral Energy who came out to correct the problem. The electrical fault was able to be rectified and the house was saved. The neighbour’s actions not only potentially saved the lady managing the house from danger, the house was also saved from destruction. Wingello now has official Post Office Boxes for rent. As we don’t have mail delivery, the boxes are available for a subsidised rate, roughly only 1/3 of the normal price. You can see the PO Boxes on the Maple Lane side of the store. We specially installed them so all boxes are reachable for all of our customers no matter how tall they may be. Just ask for an application form in the store. We have just upgraded the kitchen floor to a specially made high wear vinyl flooring which will last many years. This will be better for cleaning, safety, softer on the feet and non slip too. Combined with the landscaping outside the Old Produce Shed we are finally coming to the end of all of our repairs and enhancements, just in time for our second anniversary of owning the store. Just ask David or any of the store staff and they will gladly show you around. 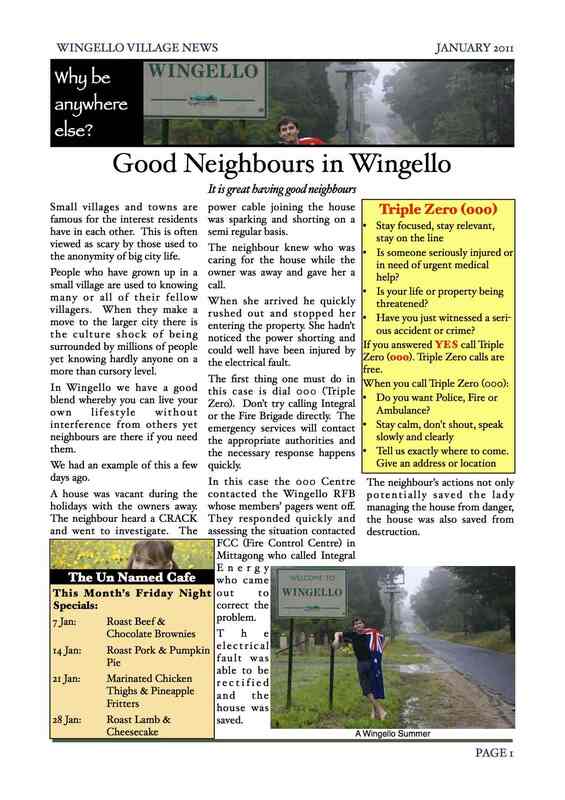 Wingello Village News for January 2011 is out.